The “graying of America” is firmly upon us. In 2011, baby boomers, those born after WWII between 1946 and 1964, started to turn 65. And by 2030, all baby boomers, a group which comprises 20 percent of our nation’s demographic, will be 65 or older. This translates to 70 million adults living as “seniors” in the not too distant future. While Wheatland, New York, today only has a small percentage of elders living within its town borders, that number will most certainly rise in coming years. The Wheatland Senior Center and its three decades of experience providing meals and social outlets to area seniors is ready to welcome new members as the “graying” peaks. In fact, the Center is hoping to draw some new faces well ahead of that time. “Right now we have about 18-20 regulars here per week. This is much lower participation than in other years, most likely because today there are many more outlets for older adults than ever before. 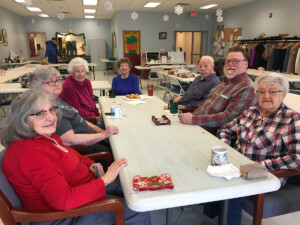 But for area seniors that are interested in staying in their own home or with a family, the Center is a great and safe way for these folks to get out of the house and interact with others,” explained Michele Adair who has been serving as the coordinator of the Center for over ten years. Countless studies show that diet, exercise, a positive outlook and a good support system are critical factors when it comes to promoting well-being and longevity. Unlike all other phases of life that are fairly textbook, aging past retirement gets complicated. Many older adults are active and would readily agree that age is only a state of mind. Others however develop chronic or progressive disease including memory loss that impedes their ability to be independent and outgoing. Adair, Alice Dillon, a nutrition center aide, and Kathleen Rick, the center’s yoga instructor, are all proud of the fact that because Wheatland’s center is small compared with others in Monroe County, it can support the needs of most seniors. An eight-passenger and wheelchair-friendly van drives around the town each Monday, Wednesday and Thursday that the Center is open, pickup up members and then delivering them home once the program is over at 3:00 PM. The van is also available to take the group out on day trips or outings that in the past have included gambling, shopping, miniature golf, and even productions downtown at The Auditorium Theatre. Rick got involved with the Center seven years ago when she introduced a chair yoga program into the mix. The yoga class has become a big draw for area seniors who may or may not participate in other Center activities. “My class focuses on helping seniors work on safe stretching, increasing balance, and improving muscle tone. These are important ways to help prevent falls which many seniors struggle to recover from. The class hosts about 25 students per week on Wednesdays at 11:00 AM at the cost of $2 per class,” offered Rick. So what other benefits await an older adult that joins the Center? Almost too many to list. For starters, each day brings an activity – bingo, yoga, and art are on rotation right now. For those who may not want to participate in formal activities, there are always card games to be played and magazines to be read. Increasingly the Center is partnering with the Wheatland Recreation Department to co-sponsor events that bring together the seniors with elementary school aged children. Though the Center offers a variety of fun and engaging social outlets, the main draw for many local seniors is the food. The Center participates in a nutrition program that is funded and run by Monroe County Office of the Aging. Hot meals are prepared by ABVI (Association for the Blind and Visually Impaired) under strict nutritional guidelines. Once ready, they are delivered to the Center each afternoon for the 12:30 PM lunchtime. “The meals are really good. They are made to be low sodium and also comply with other best practices for senior nutrition. For many members, this is their one big meal of the day. They go home pretty full and then don’t have to worry about cooking later since a light meal or snack might do,” Adair explained. The Center also offers many supportive programs for the unique administrative challenges a senior on fixed income may face. Each month a case worker from the non-profit ElderSource pays a visit to the Center to consult with members on applying for benefits to help pay for heat or food, or to make recommendations on issues related to taxes, medical needs and so forth. The Center also offers monthly blood pressure checks through CHS and has a nutrition counselor as well who is happy to help with one-on-one diet counseling. And then there are the outlets for helping keep seniors informed. Recently the Center offered a presentation on avoiding online scams that target older adults. Adair and other employees also just had training on administering Narcan, a medication to reverse the effects a drug overdose. Overdoses in this population tend to stem from confusion and are accidental in nature. But a real concern nonetheless. The Wheatland Senior Center currently has capacity to host more elders over the age of 60. It is not a requirement to live in Wheatland to take advantage of the services the Center offers (however the van is only able to transport those living in Wheatland). There is plenty of parking for any members that are still driving. “The best way to see what we are about is to schedule a short tour. If someone wants to join after that, it’s a fast and simple process. We truly are hopeful to add more to our great little group in 2019 – we have a lot of neat things planned!” added Adair enthusiastically. For anyone with questions, including how to schedule a tour of the Center (22 Main Street, Scottsville) call 889-1284. The Center is open Mon/Weds/Thurs from 10 AM – 3 PM. Adult children of seniors are encouraged to talk to their parents about the socialization merits of senior-focused day programs if they are home alone for long stretches or could use some senior comradery.